I am in my 30’s and this is my story. Dr. Barry Schiff is my primary physician and cardiologist. After one of my visits, he informed me that my cholesterol was a mess (275, Trig: 846, HDL: 43), my blood pressure was still high (even on medication it was averaging 140 – 90s). Dr. Schiff told me that I was living a reckless life, and asked me, do I really want to continue living this way? He then said, “I can put you on more medication, or you can change your life,” and of course I said NO to medication and YES to a Lifestyle Change. So that next week I went to see Dr. Schiff at CardioMender, MD Weight Loss Specialists. Starting the process I weighed in at 251 and was wearing size 42 slacks. The first week on the program I lost 17 pounds. I said “WOW, I can do this.” At week 10, I was down over 50 pounds, and was feeling great. My blood pressure was averaging 112/68 weekly, and my blood test showed my cholesterol PERFECT (176, Trig: 53, HDL: 94.4). At this point Dr. Schiff pulled me off my blood pressure pills!!! As of today, three months in (13 weeks), I am about to hit 60 pounds off, I am wearing size 34 pants and 42 suit, and I am off all medication! My weight is about to be in the 180s, which I haven’t seen in over 12 years. 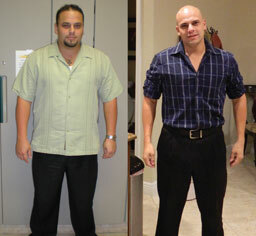 Every time I talk to Dr. Schiff I thank him, because he made this lifestyle change an easy one; he made it possible! With your want and the right guidance (Dr. Schiff and the staff) you will definitely achieve healthy living. Weekly I am surrounded by others in the same shoes at the Wellness office. Dr. Schiff and the Wellness Program are not just helping people lose weight, they are educating us on healthy living, assisting us in our lifestyle changes, and most importantly, extending our lives! I could never put a dollar amount on Health and Life… This experience has been worth every penny, and once you start it’s really easy!